I was hired to “revive” and maintain the Twitter account for Elijah DeJesus, which had 277 followers. After two weeks of maintaining the account, the number of followers increased by 49%, with total engagement increasing by 29% (compared to the previous month). 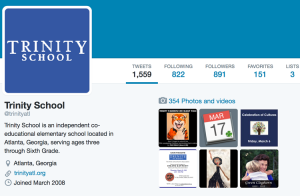 I began managing Trinity School’s Twitter account in August of 2012, when it had 93 followers. The number of followers increased to over 235 by May of 2013. As of November 2015, the account had 1,038 followers.